Savvy followers of mecha anime have long been aware that “bad guy” machinery is often built to be more interesting, both conceptually and visually, than the protagonist side’s machines. This trend did not invent itself. In many ways, it was begun back in the original Gundam series with the lowly Zaku. Suspiciously close to the pronunciation of zako (雑魚）、Japanese for “small fry” (a term very frequently used in video gaming to describe anything not in the “boss” category; i.e. normal, regular enemies), the Zaku is the first, and most prolific, of the robotic behemoths called Mobile Suits (as opposed to Normal Suits, the Gundam series term for spacesuits) faced by the protagonists in the original series, Mobile Suit Gundam. The Zaku is the Republic of Zeon’s first, and primary, mass-produced Mobile Suit during the conflict known after the fact as “The One Year War.” (Acronym: OYW) Having a mere one thirtieth of the on-paper production capacity of the Earth Federation, which dominated not only Earth but the vast majority of space colonies at the start of Mobile Suit Gundam (Acronym: MSG), what Zeon needed was not a single super-weapon, but a mass produce-able general purpose weapon that could dominate space combat. 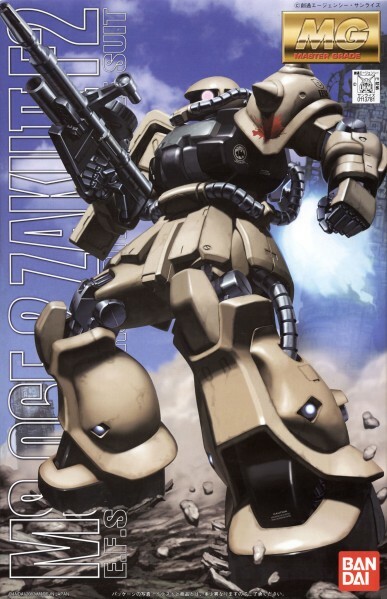 The “MS-06” Zaku is the 6th generation of development, though the first to see mass production. This last part requires quite a bit of suspension of disbelief on the part of the viewer, rendering this firmly science fiction rather than pure speculative science. The idea that a Mobile Suit can move in human-like movements, however clumsy they may be shown as, is a stretch that we need to process to be able to just sit back and enjoy the show. That’s how it is. Beyond these basic features, the MS-06 Zaku has distinguishing characteristics that stand out even after 30 years of animation history.Technically, it’s the MS-06 Zaku II, because an earlier model that saw very limited mass production, the MS-05 Zaku I, existed and was combat ready, but only in extremely crude terms, and was markedly inferior in all respects. Any Mobile Suit might be considered better than none, but still. Zakus are green. That’s the way it’s always been; that’s the way it always will be. This holds true for just about everything but ace models with personal color schemes, such as the legendary One Year War ace Char Aznable, chief antagonist as regards the main protagonist of the series, 15 year old youth Amuro Ray. Notwithstanding this, the basic model of every major variation is some sort of green. Minor variations, such as versions tuned for desert warfare (complete with desert camouflage), come in colors deemed appropriate to their purpose. Considering that we are talking about futuristic machines here, the Zaku II is absolutely retro in concept. While it does employ a miniaturized fusion reactor made possible by Mobile Suit Gundam’s Minovsky Particle -based super-science, actual limb mobility is through hydraulic power, as basic and low tech as you can get. Thrust is provided by the use of super-heating a fixed supply of propellant; that is, gas that isn’t actually burning when it exits the thrusters. As you might imagine, this is far more effective and dramatic in space than on Earth, where limited rocket boosting and physical walking renders the Zaku II overwhelmingly earthbound. While it would be an exaggeration to say that anyone can pilot a Zaku, it’s like this: a normal pilot can put it through an incredible amount of abuse without breaking the machine. The Zaku may not be the thickest skinned machine when it’s being shot, but short of flying it into the side of a ship, you’re probably not going to total one through piloting alone. This ease of use and low degree of sensitivity makes the Zaku an ideal training platform. Amazingly, even years after the One Year War, the victorious Earth Federation employed Zakus as “Red Team” units for training purposes, as seen in Gundam 0083: Stardust Memory. Not only did this create an unmistakable “enemy feel,” it was cheap; the Zaku is easy to maintain (relative to giant robots!) and hey, a few refurbished models beat having to manufacture your own stuff to get plastered by paint rounds. Here we get into the heart of the Zaku’s charm. 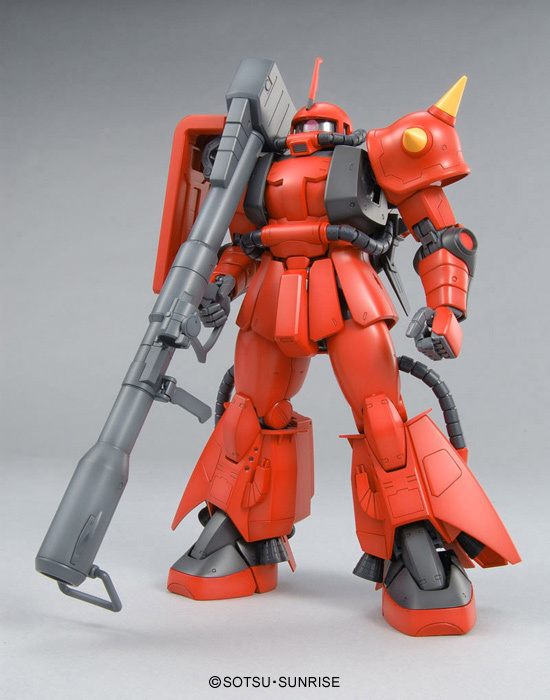 The Zaku, being essentially a giant infantryman, uses good, old fashioned bullets for its best known weapon, the Zaku Machine Gun, so named because its reliability and ubiquity was so great that it was employed by non-Zaku suits (particularly transitional prototypes).This is essentially a robot version of a Tommy Gun, the drum-fed .50 caliber machine gun used in the Prohibition era by Al Capone’s gangsters. For the uninitiated, a machinegun fires bullets, i.e. slugs; inert metal rounds. A cannon, no matter the type, fires explosive rounds. Zaku II’s typically employ bazookas for heavy work; these were used for attacking warships as well as early attempts to destroy the Federation’s Gundam mobile suit, which had special armor that simply was not being defeated by machine gun rounds. Both weapons were employed in space and on Earth (or inside air-filled colonies) indiscriminately. Zaku type mobile suits tend to have at least some kind of variation of the Heat Hawk, a tomahawk with an edge that is superheated via the nuclear reactor’s power a moment before being employed in actual combat. It’s crude, and no Zaku will ever be accused of practicing swordsmanship, but that’s part of the point: all the pilot has to do is hack and chop and this reliable, brute force weapon will chew through normal armor like a hot knife through butter. The Zaku is not a light machine. As a consequence, it is vastly over-engineered for structural strength (which is not the same as thick armor). 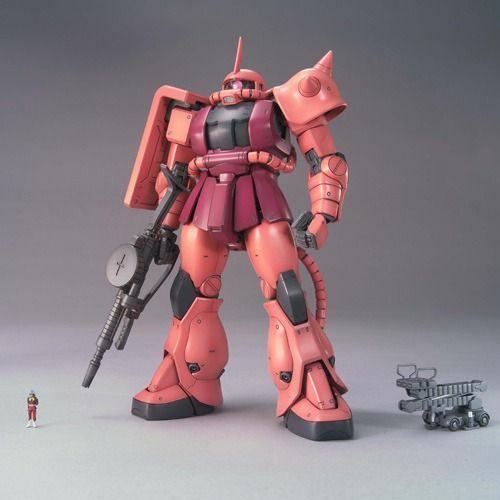 The Zaku can accommodate extra-heavy backpacks, heavy weapons, and so forth, with no trouble at all. One might think of it almost like a pack mule, but it was a combat machine, so using it for mere transportation of supplies would be silly. One of the biggest reasons for the lasting impression the Zaku made is the sheer number and weight of variations. Many of these were promoted as toy variations, with ace models receiving custom color schemes complete with pictures and biographies of their ace pilots, who existed completely outside of the original animated show, but who live on in video games such as G Generation Spirits. 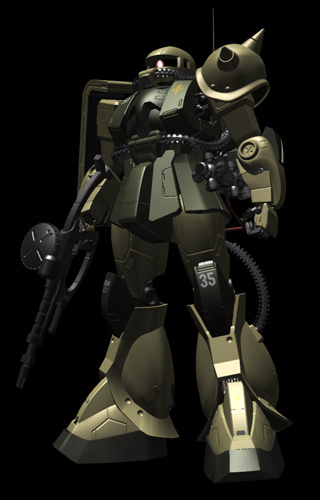 The basic mass-produced model was the MS-06 Zaku II F-Type, which was the main model used for space combat early in the war. An even earlier C-Type had been used as a nuclear bazooka carrier during the first days of the war, when a huge amount of humanity’s population (most of which was in space colonies) died in the crossfire between Zeonic forces and very much not picky Federation Navy forces. This type introduced the distinctive “shoulder spike” look, used for ramming, and the opposite, limited shoulder shield, providing some extra protection. The J-Type was customized for ground surface warfare, and consequently, boosting through an air-filled environment. While the F-Type could do this, it wasn’t very good at it, and the J-Type – equipped with leg-mounted missiles and using tank cannons as alternatives to bazookas – became the face of the months of grinding ground warfare. The High Mobility Test Types (there are different flavors) were essentially the F-Type with souped up thrusters and verniers. These preceded later non-Zaku mobile suits but, in good hands, these machines performed exceptionally in the skirmishes against Federation forces that dominated space combat until the Federation blitzkrieg that ended the war. Numerous types of Zaku had commander type variations, which consisted of tuning up the machine, which was not externally obvious, and adding a vertical fin to the forehead, which absolutely was obvious and provided a simple measure of who you should be following in a confused combat situation. A very wide number of minor variations exist, such as for desert warfare, camera reconnaissance, underwater use, and so on. These exist because of the aforementioned virtues of the Zaku: such a fundamentally sound and rugged design that you could do these things and not lose basic functionality. Even though there have been numerous Gundam series, movies, OAV’s, and so on and so forth, Gundams can only be used to their full potential by ace pilots with exceptionally rare levels of talent. To the contrary, anyone can picture himself in a Zaku, and a Zaku, in the right hands, is plenty powerful enough to do a lot of damage. 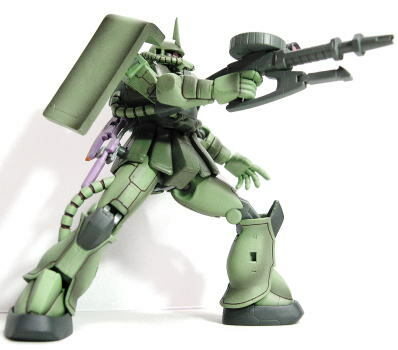 Consequently, the Zaku is a more approachable concept that is easier for people to actually imagine themselves in (provided they were born in a dark science fiction future). The Zaku is really the start of the idea of grunt mecha, i.e. mecha used by “grunts,” infantrymen fighting in the proverbial or literal trench warfare that dominates real warfighting. This is the concept, and the implementation thereof, that provides the realistic, gritty “war” feel to Mobile Suit Gundam, where even the lowliest machine is piloted by a human being, meaning that every victory comes with an extension of the terrible casualty rolls of war. So, in many senses, the Zaku is where the gritty, realistic trend began. To this day, the Zaku is a standard by which all other grunt mecha are compared. Is it cool? Is it gritty? Does it have the right feel? Always, we look back to the Zaku and ask, is it like that? Is it distinct, but with its own feel that measures up? This entry was posted in Gundam and tagged anime, G Gen Spirits, Gundam, mecha, mobile suit, sci fi, video games, Zaku. Bookmark the permalink.